St. Mary's Anglican Church in Elliston is part of the Bonavista parish, whose origins date back to 1723 when English missionary Rev. Henry Jones arrived in Bonavista. Jones later established the first school in Newfoundland at Bonavista. 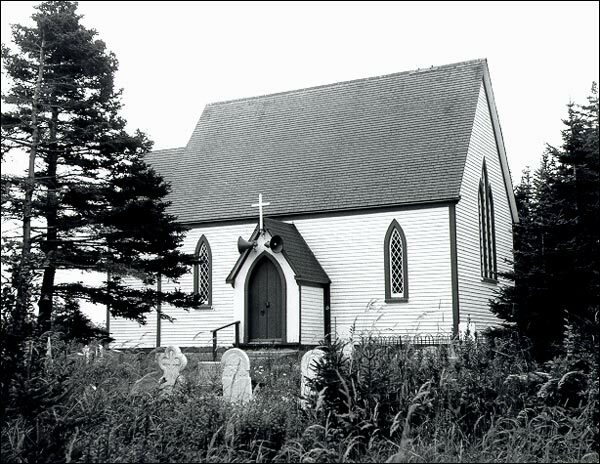 St. Mary's was the second Anglican church to be built in Elliston. The first church had been built on the same site and consecrated by Bishop John Inglis of Nova Scotia in 1827. St. Mary's Anglican Church is a good example of the vernacular Gothic Revival style. Allan Ryder and his son, Robert, built the present church in Elliston between 1872 and 1875. Local merchant planters Robert and Arthur Tilley agreed to pay for part of the construction. The church accommodate 100 people. St. Mary's shape, windows and scissor-braced roof truss provide a good example of the Gothic Revival style applied to a smaller structure. This style of building was common to Anglican churches constructed in the nineteenth century. The Anglican minister at the time of construction was Rev. Augustus E.C. Baly who served as rural dean in the Bonavista Parish from 1866 onwards. His son, Augustus George Baly, later held the same position in 1900 and later became Canon of the Anglican Cathedral in St. John's. The Heritage Foundation of Newfoundland and Labrador declared St. Mary's Church in Elliston a Registered Heritage Structure in October 1988. The church serves the communities of Elliston and Maberly. Also view St. Mary's Anglican Church Registered Heritage Structure, and St. Mary's Anglican Church and Cemetery Municipal Heritage Site on the Heritage Foundation of Newfoundland and Labrador web site. The Newfoundland and Labrador Heritage Web Site has on its site only a portion of the registered heritage structures in Newfoundland and Labrador. To view a complete list or search for a particular structure visit the Heritage Foundation's Property Search page.